I already owned three bottles of Magnetic Nail polish, but when I heard China Glaze was coming out with it, I was BEYOND excited. China Glaze is one of the BEST brands out there in my opinion, and it's under $6. Score. What makes this superior to the Nails, Inc. magnetic polish (besides being $10 less,) is that you have the choice of 3 different patterns to apply to your nails: an arrow pattern, stripes, and a star. I bought 4 of the colors, leaving out the grey and the green, but am considering going back for them. I actually took the blue and light purple to my sister-in-law's yesterday and did 4 mani's for my nieces, their friend, and my sister Abbe. I left them those 2 colors as they were QUITE the hit, and will be used for future "science show and tells." This is one coat of 'You Move Me' and the stripes magnet. I put a topcoat of Elf 'Golden Goddess over it to add some sparkle. I bought the Elf collection of 5 polishes around Christmas for $5, so this too was a steal! 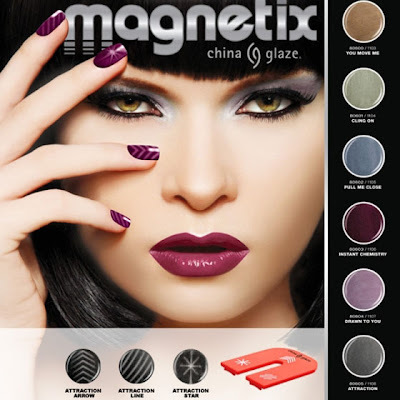 You can purchase the China Glaze collection at Sally Beauty Supply, they're currently having a special, buy two polishes, get the magnet free. Each bottle and magnet is $5.99, so it's worth picking up a second bottle! The nail boards I follow seem to favor this color with the star magnet, it makes a tiger's eye affect. So, which one are you running out to purchase?